I came across this book as I was feverishly browsing through thousands of Kindle freebies and mindlessly downloading every other book that managed to spark even an inkling of interest in me. I like Mozart’s compositions. I think his style of music is quite accessible even to those with just a passing curiosity in classical music. And I absolutely love the deep and majestic sounds of the piano and ardently wish every year to start learning to play the instrument. So far, with my sub-par motor skills and extreme lack of dexterity, my dream just sinks a little lower and lower. Anyway, I’m shooting off on a tangent. This book seemed interesting because it looks into the life of Mozart’s sister, Nannerl, who was supposedly as talented as her brother, but was resigned to her fate of being a woman who couldn’t hope to travel the world and have a career. The world hadn’t embraced feminism in the 18th century. I was curious to read the interpretation of a woman’s thoughts as her brother rose to fame and glory while she had to live through the rusting of her musical talents. Intertwined with the chronicles of the musical genius, Wolfgang Mozart, the book breathes life into a neglected member of the talented Mozart family. I love biographies of my favorite personalities. But I don’t necessarily like to read a historian’s dry account of a person’s life. Historical fiction comes to my rescue in such cases. 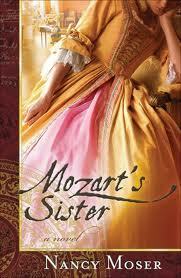 Nancy Somer’s sensitive writing has crafted a realistic world of the Mozart family. I appreciate her characterization of Nannerl. She shows a righteously envious girl, who craves for her father’s approval and attention, when he was steeped in his efforts to promote Wolfgang’s talents, and to make a name for him. But despite the tension of jealousy in any sibling rivalry, the undercurrent of kinship and familial bonding never ebbs. The bond shared between brother and sister was quite strong despite how far apart they drifted. Nannerl’s love for her dad clashes with her innermost desire to rebel and seek freedom, but Somer has beautifully shown how she mellows into acceptance of her family and her life, and chooses the course of her life with pragmatism. In these aspects, Nannerl’s personality seems to mirror mine. I could relate to the character and her decisions with empathy and frustration. I quite liked the book for Somer’s meticulous and apt characterization of Nannerl.... no parts of the fact and fiction contradicted or seemed discordant with each other. Some characters such as the mother, might have been a little stereotyped, but the characterization gelled with the story and the time period. Other than the story of the Mozart family, most of the book is filled with the family’s travel around Europe, the constant haunt of illness threatening to kill them, the pressure of financial stability, the treacherous politics of the nobility and the monarchs, and how all of these played their part in stifling Nannerl and extorting Mozart to slave and constantly churn out operas and compositions, so that he be recognized and awarded. I have had this notion that geniuses don’t really have to work hard. They say talent literally spews out of them uncontrollably and involuntary. If so, they are so blessed to just express their abilities and enjoy doing it. It didn’t seem like too much work to me. That shows my appalling ignorance.Stories like this shed light on the hard work that needs to go in to promote oneself, network with the right people, appease the powerful ones and be acknowledged. It’s the same old story - I thought these things weren’t as necessary two hundred years back. Besides, creativity cannot be forced or be channeled to deliver under specifications. Mozart’s life was such an example, and Moser conveys it well. This book is therefore as much about Mozart and his domineering father, as it is about his sister. Although I didn’t enjoy learning about Mozart’s travels and constant shuffling, I liked how his sister was given the attention and recognition she never received when she lived. I really like Mozart too ! I wasn't aware that he had a sister. Unfortunate that she didn't get the opportunities she deserved... Will try and get hold of the book. As to playing the piano - I'm sure that if you stick with it, you'll play well in time! If I remember right, Mozart had played the piano for a few thousand hours before the age of five! So, no doubt he had to work insanely hard to become a genius. Thanks for the encouragement Karthik! I should really start taking classes soon.